Carpets are often seen to accumulate a fair degree of dirt, stains, and grime over the years. It can happen even if the homeowner took certain basic measures to prevent the soiling of the carpets. In fact, when the carpets do get mucky, there are two common methods to clean them – steam cleaning and dry cleaning. Their functioning is pretty much similar to the way they work for laundry cleaning, with both the methods – dry cleaning and steam cleaning – having their own set of advantages. Depending on certain factors, the homeowner needs to know how to choose between the two different cleaning methods. It is only a myth that the steam process can clean the carpet. Here is the foremost and important thing you need to know in the debate of carpet cleaning: There are machines which work at small scale level for domestic use and large-scale level for professional cleaning services, both of them require hot water and produce steam. 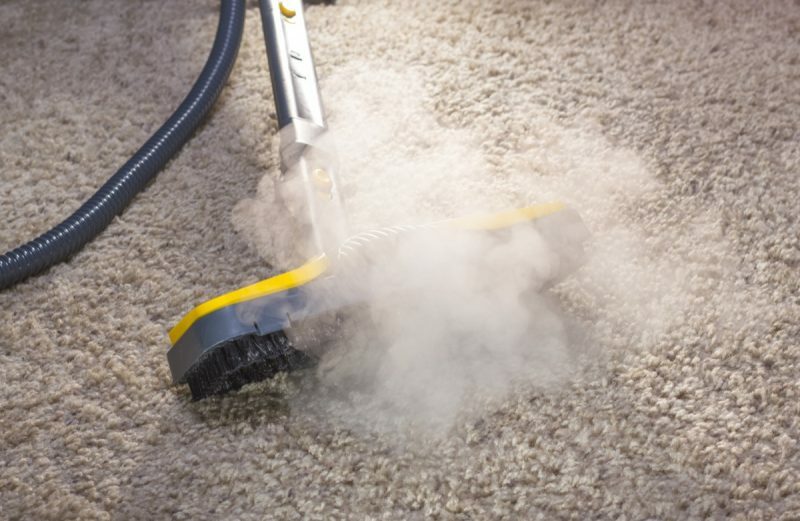 Henceforth, steam is only a discharge produced in the process and is not responsible for the cleaning of carpets. It is the detergent used during the steam cleaning process that performs the main task of cleaning. Hot water is only used so that the detergent settled on the fibers are activated. When detergent powder or solution is poured into the machine, it is sprayed on the carpet before it is treated with hot water. The nature of detergent varies for different types of carpet such as acidic for natural fiber and wool carpets, and alkaline for carpets of synthetic fiber. A steam cleaning process is not complicated. All it takes is a machine that can be owned or rented, right detergent powder or solution and hot water. However, the main disadvantage of steam cleaning is that the process takes longer, especially because the carpet is soaked and needs to be put out in the sun to dry. Commercial cleaning will be needed for the carpets that are deeply affected as the domestic cleaning machines won’t be capable of eliminating stains which refuse to go. A method of placing dry chemical compounds can be used for dry cleaning of carpets. These compounds are capable of removing dirt present in the carpet. It is not entirely a dry process as the cleaners require a little bit of moisture in order to support the activation of dry compounds. The main advantage of dry cleaning is that it takes very less time. The carpets need not be put out in the sun for drying as they are not soaked during the cleaning. Once the cleaning process has finished, carpets can be used right away. It is the main reason why dry compound cleaning is used in spaces where quick replacement is essential. For the best carpet cleaning services in London, contact Top Cleaners today!